Tonight, I’m coming to you live from the Idoldome! Where, for the 45 minutes between when you’re supposed to get there and when the warm-up guy starts working the crowd, the Stave Oval projects a static image of an overcast sky. I immediately understand the numerous audience yawns I’ve spotted this season. Still, we are in the VIP area, tantalizingly close to Nancy Grace and the guy Pam almost married on The Office. Can you stand it? There are two themes: The sixties, and “Britpop,” which can’t mean actual Britpop, but hope springs eternal. And our mentor is Steven Van Zandt, whose primary job here is to goof around with Jimmy Iovine like your dad does with his friend from college. Hollie’s up first with “River Deep, Mountain High.” Steven and Jimmy counsel her to stop worrying about entertaining the crowd, which seems like horrible advice, but it works! She is looser than she’s ever been, her pitch is mostly on point, and the live crowd loves her. She’s back! (Or: here for the first time!) The judges love it. Skylar runs out to hug her as soon as we go to commercial. They’re really friends! Phillip does his take on Joe Cocker’s take on “The Letter.” He knows how to work within his range, and in the Idoldome, he has a goofy ease with the stagehands and backup musicians. Fist bumps all around. He is a man of the people, which goes a long way with me. There is talk of his girlfriend being in the audience, but I don’t know exactly what they say because I am not trying to hear it. The judges go nuts. Skylar takes Jimmy and Steven’s advice and goes for CCR’s “Fortunate Son,” which ends up suiting her perfectly. It is so nice, in fact, that I kind of want to hear her sing the whole thing. I know our attention spans are short, but at this stage in the game, wouldn’t it be refreshing to see how these kids hold it together for a whole four-minute song? The judges love it. Skylar blows kisses to the fans in the pit. She seems to be a genuine little firecracker. I should say here that everyone sounds about a million times better live than on television. This is a monstrously talented bunch of kids. Also, tonight the boys will sing a duet and the girls a trio. Phillip and Joshua are up first with the Righteous Brothers’ “You’ve Lost That Lovin’ Feelin’,” which they have never heard before. There is a moment of forced banter before they start, and if you think these comedic moments work poorly on tape, come see them in person. Clunk-a-roo. Ditto for the duet itself at first; their voices blend poorly, their lack of familiarity with the song shows, it comes off like fraternity brothers on a karaoke night dare. But just before the end, it’s like the Jäger shots kick in; Phillip’s growl and Joshua’s screech complement each other and they start having fun. But not too much — Phillip attempts to put his arm around Joshua, who wriggles out bashfully. Joshua is super-uncomfortable with his sexuality, which reveals itself to have been his problem all along. Jessica does “Proud Mary,” which Steven admits anyone who’s ever played in a bar band hates. I bet that’s true, but I know it’s near the bottom of my list of things I want to hear a child sing. You know how it goes: She is flawless, but it lacks soul, and as she runs around the stage, you can tell she’s trying not to snap an ankle in her complicated heels. The judges love it, minus Randy, who doesn’t bother to explain why. Oh, and this all happens in front of a crystal-beaded curtain that the stagehands struggle to hang and then remove, which seems like a misuse of time and effort when the judges still don’t know who’s supposed to talk first. Joshua wears some kind of gay carnival barker sportcoat in his performance of “Ain’t Too Proud To Beg.” Randy compares him to Terence Trent D’Arby, and he’s right, if Terence Trent D’Arby were a terrified church kid. Here’s a perfect illustration of Joshua’s issue: There is a flower on his lapel, and Ryan tells him to give it to a girl in the crowd. When Ryan Seacrest has to tell you how to flirt, you are in big, big trouble. And then it’s time for the Britpop round. Hollie takes on Lush’s “Sweetness and Light” Leona Lewis’s “Bleeding Love.” I dislike that song intensely, but her take is unique and intimate. Hollie is making a strong showing tonight; she’s finally going for broke and interpreting these songs. She is also beautiful in person. The judges love it, even Steven, who’s never heard the song. It’s official: Steven Tyler’s world is significantly better than ours. Phillip goes for “Vapour Trail” by Ride “Time of the Season” by the Zombies, and for once, he actually tries to sing the melody. The trouble is, the chorus requires him to go into a falsetto that he doesn’t have. The judges would nail anyone else for missing those notes, but they love it. (Also, no they wouldn’t; not these judges.) My problem is that this song contains the lyric “Let me try with pleasured hands,” which consistently makes me have to go outside and vomit, and we’re not allowed to leave the Dome. The tiny girls in front of me with “I LUV SKYLAR” signs have no idea of the danger they’re in. The girls’ trio is next, and they promise some “girl power,” which makes me hope in vain for some Spice Girls. Alas, they do Jackie Wilson’s “Higher and Higher.” For a moment, I get annoyed that they’re doing a song from before they were born, when they could sink their teeth into something halfway current, but then I realize that The Spice Girls are from before Jessica was born. Take a moment and savor that realization. Skylar’s Britpop classic is Elastica’s “Stutter” Dusty Springfield’s “You Don’t Have to Say You Love Me.” There are fake gaslights and backup singers on benches; it is all very Lawrence Welk. And the song is almost too wordy for her; a slowed-down arrangement might have given her more of a chance to settle in. The judges love it. Jessica does “Common People” “You Are So Beautiful.” Here’s the deal about that song: Joe Cocker’s version makes you believe that a person who looks and sounds like Joe Cocker is on someone’s porch at 3 a.m., drunk and heartsick, begging in vain for her attention. Out of the mouth of a lovely 16-year-old girl, it cannot be anything more than a nice song. So it’s fine, except that it’s missing everything that makes it interesting. The judges super-love it. Our grand finale is actually pretty grand: Steven and Jimmy have assigned Joshua “24 Hour Party People” by Happy Mondays “To Love Somebody” by the Bee Gees, with which he is unfamiliar. (What are they teaching the young singers of America these days?) But he tears into it, and for once his chaste melisma suits the material; his version recalls Michael Bolton’s, whose name is never invoked. In the Dome, there’s really no getting around how great a singer this guy is; he just needs to connect with his physicality at some point in his life. 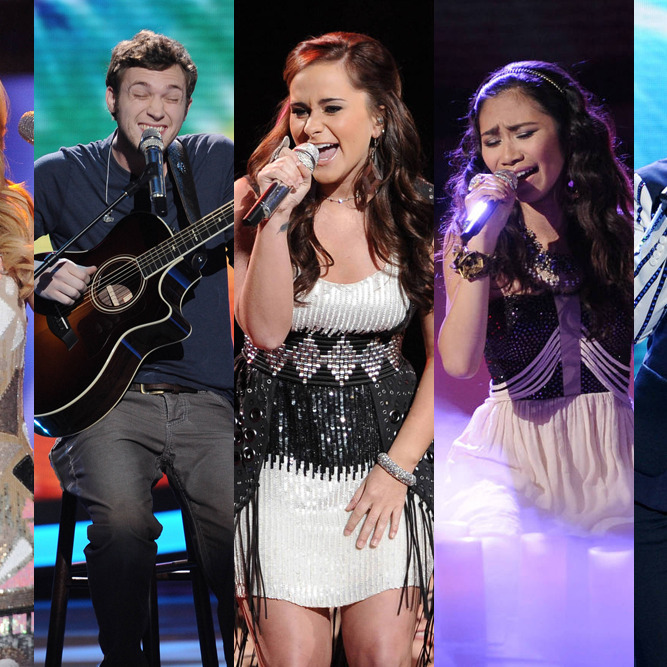 So our top five is comprised of two flawless singers who need to get their hearts broken, one country gal and one Dave Matthews-y guy who are going to sell millions no matter what happens, and Hollie, who made a pretty strong comeback tonight and who is now unquestionably The One Who Needs It The Most. I think tomorrow is Jessica’s last stand, but it really could be anyone. Now if you’ll excuse me, I’m going home to dig out the first Stone Roses album.